The Dungeons & Dragons Dungeon Master�s Screen � Of Ships and the Sea is a useful accessory for running adventures on the high seas, including those in the upcoming Ghosts of the Saltmarsh collection (see �'Dungeons & Dragons: Ghosts of Saltmarsh'�). The front displays a variety of scenes from oceanic adventures, while the back includes a variety of handy references to help the DM run sea escapades, including a list of Random Ships, common water-based Encounters, and Hazards a ship-bound crew may face. 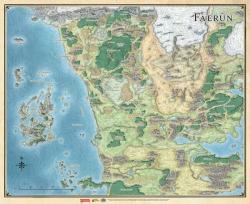 The official Dungeons & Dragons Sword Coast Adventurer�s Guide Faerun Map will include a 27� x 33� high-quality, full color vinyl map perfect for tracking an adventuring party�s progress across the Sword Coast. It includes iconic locations Waterdeep, Baldur�s Gate, and Neverwinter; among others.